With skills-based routing, you can set up "skills" and associate each one with individual agents. For each skill, you also define a set of ticket conditions. Then you configure a view that identifies which tickets match the skills of whomever's looking at it. Before getting started, you may want to check out Best practices: Setting up skills-based routing for suggestions about how to best approach this process. There are two elements that skills-based routing is built on: Skill types and skills . Skill types are simply categories for skills. For example, "Languages" is a skill type, and "French" is an individual skill. "Country" is a skill type, and "Belgium" is a skill. Skills are any attributes of an agent that determine their suitability to work a ticket that requires them. A skill can be something the agent is able to do, like speak French. But a skill can be any other fact about the agent, like being located in the Brussels office. Currently, skills-based routing uses the existing paradigm where agents pull tickets from views. You can configure a view that filters tickets by skill to organize tickets so agents possessing certain skills can quickly find those tickets they are qualified to address. The following is an overview of the steps you'll take to route tickets into useful views. Create skill types, to organize your skills into categories. 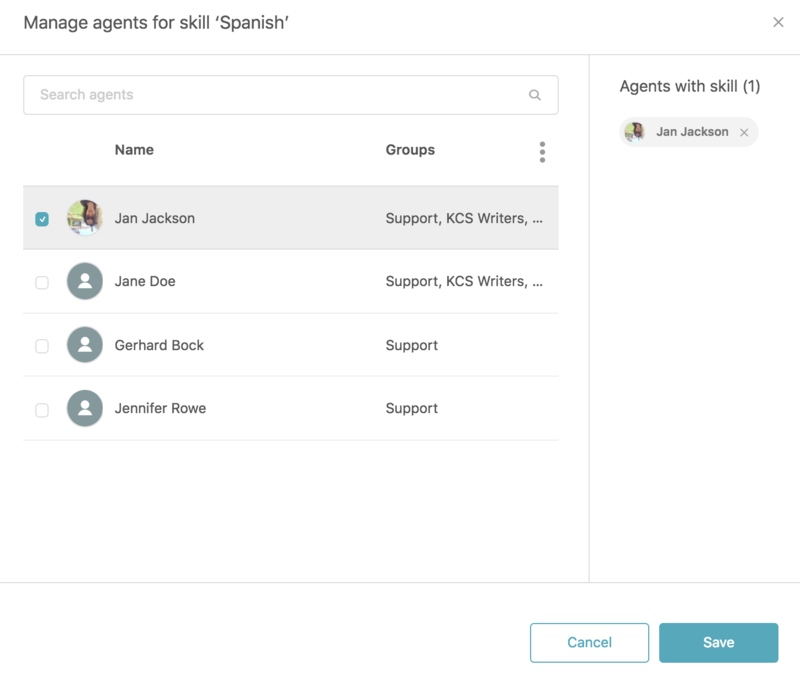 Add skills to the skill types, based on your customers' needs and the skills or qualities your agents have (language, time zones, and the like). Identify agents' skills, and assign them to as many skills as you like. Build routing rules for each skill, so skills can be applied to the right tickets. Create a view to filter tickets based on skills, so the agent can focus on the ones they are best qualified to answer. For Insights users, there’s a pre-configured Skills dashboard that shows how skills are being used, and how they impact the tickets they’re applied to. You can build your own, custom reports using skill metrics as well. For more information, see Analyzing skills-based reporting activity. You'll need to create at least one skill type before you can set up specific skills. You can create up to 10 skill types. In Zendesk Support, click the Admin icon ( ) in the sidebar, then select Business Rules > Routing. On the Routing admin page, click the New skill type button. Enter a unique name for the skill type. Names cannot exceed 96 characters. Repeat these steps for each skill type you want to create. After you've created one or more skill types, you can add your specific skills. Once you've added a skill to a skill type, a new Skills ticket field appears on tickets viewed by administrators. Visibility options can be modified by Configuring the skills field viewing options. Skills can be viewed, edited, or deleted after they've been created, and skills can be manually added or changed by an administrator on a ticket-by-ticket basis. For information on this, see Working with skills. Each skill type can include up to 30 skills. On the Routing admin page, locate the skill type you want to update, and click the New skill button. Enter a name for the new skill. Names cannot exceed 96 characters. Note: Each skill within a skill type must have a unique name. However, skills in separate skill types can use the same name. Hit Enter. The skill is added to the skill type. For each skill, you need to designate agents who have that skill. Adding agents to specific skills, via the Routing admin page. This is particularly useful when assigning multiple agents to a skill at once. Adding skills to specific agents, via the agent’s profile page. This option is good when onboarding new agents who need multiple skills assigned to them. On the Routing admin page, click the skill type you want to open, then click the skill you want to update. Filter the list of agents by group, by clicking the options icon ( ) and selecting the group name. Select agents by clicking the check box to the left of their name. Once selected, agents appear in the Agents with skill list. In the Agents with skill list, locate the agent you want to remove, then click the x next to their name. In Support, open the agent’s profile. You can do this by clicking their profile picture and selecting View profile, or clicking their name on the Manage > People admin page. Scroll down the profile to the Skills field in the left sidebar. Click in the box to open the skills picker. Click the skill type, then the skill, you want to assign to the agent, and repeat as needed. The skill appears in the agent’s skills list, and the agent appears as an assignee on the Skills admin page. On the agent’s profile page, scroll down to the Skills field in the left sidebar. Click the x on the skill you want to remove. The skill is removed from the agent’s skills list, and the agent is removed as an assignee on the Skills admin page. Each skill needs conditions defined to determine which tickets they're applied to. These sets of conditions are called "routing rules." When a ticket is created that meets the conditions defined in a skill's routing rule, that skill is attached to the ticket. You can create views based on those skills to direct agents to tickets they are qualified to address. If a ticket is created before a routing rule is set up, it won't have that skill attached to it. If a skill is renamed, however, the skill name is updated on the ticket. On the Routing admin page, click the skill type you want to open, then click the skill you want to create a routing rule for. In the Tickets section, click the Add condition button under Meet All of the following conditions and/or Meet Any of the following conditions. If you add conditions under Meet All of the following conditions, all of the conditions must be true for the skill to be applied. If you add conditions under Meet Any of the following conditions, one or more of the conditions must be true for the skill to be applied. Select a condition, a field operator, and a value for each entry. When all conditions are added, click the Save button. When a skill is applied to a ticket, it appears in that ticket's sidebar. For information on modifying these skills, see Working with skills. 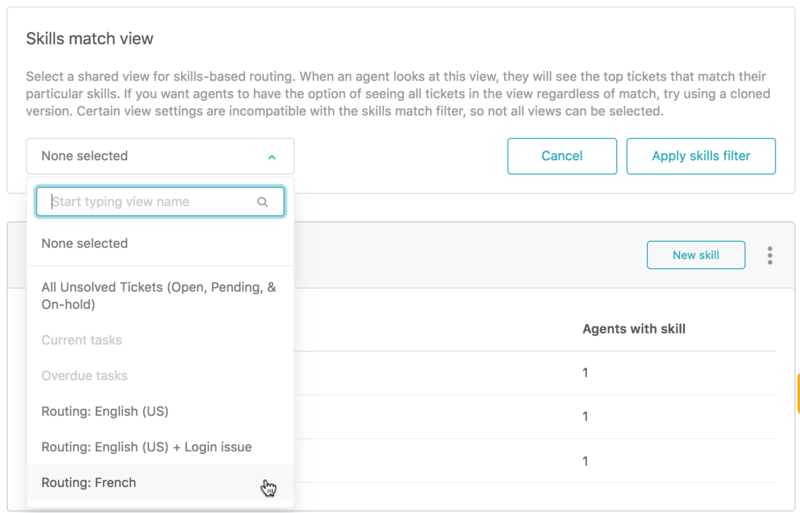 You can create a view that includes any ticket conditions you want, then add a filter to that view, so agents see only those tickets with skill requirements that match their skills. First, you need to create the view you want to filter by skill match. Open the Views admin page by clicking the Admin icon, then going to Manage > Views. 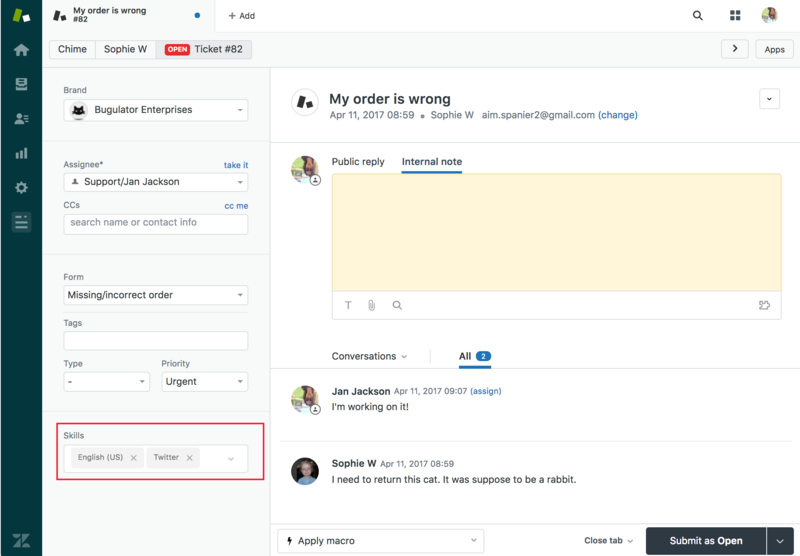 Create a view, or clone an existing view, that covers common support requests (see Using views to manage ticket workflow). Optional: On the view's edit page, scroll to the Table columns section, and drag Skill match into the Columns included in table list. All tickets in the view should have a checkmark in this column; if they don’t, go back and check your view conditions. You can also use the column on its own, on any view, in lieu of the filter. This will tell the agent which tickets match their skills without actually hiding the ones that don’t. Update the rest of the view as needed, and click Submit. After you’ve created the view, you can then apply the filter, so agents looking at the view will only see tickets that match their skills. Go to the Routing admin page. 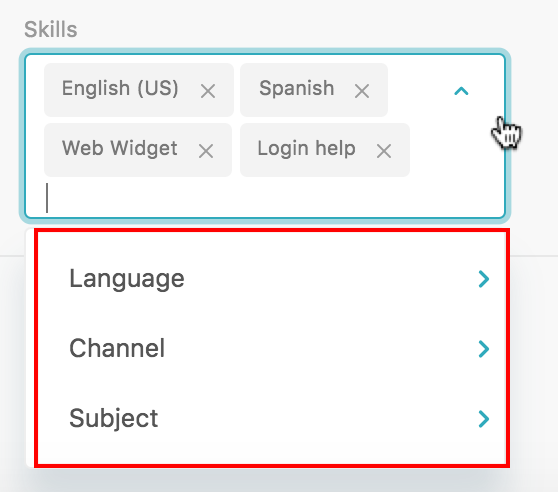 In the Skills match view section, use the drop-down menu to select the view you want to filter by skill. Note: Only certain views are compatible with filtering. Incompatible views appear in the drop-down menu, but are grayed out and cannot be selected. When an agent opens the view, they’ll only see those tickets for which they match all required skills. When an agent uses Play mode with the view, only skills-matched tickets are displayed. Admins can view the skills applied to a particular ticket in the ticket UI. Currently, agents cannot see or update skills on the ticket. Locate the ticket in your ticket views. Click the ticket subject to open it in the main window. In the ticket's sidebar, locate the Skills field. The skills applied to that ticket appear here. You can update the skills applied to a specific ticket from within the ticket UI. In the ticket's sidebar, locate the Skills field. Click the skill type containing the skill, then click the skill you want to add to the ticket. Repeat as needed, then submit the ticket. Click the x on the skill you want to delete from the ticket. Submit the ticket. The skill is removed from the ticket. By default, only administrators can see and update the skills field. You can configure the visibility and permissions for the skills field, so agents can view (but not update) it as well. On the Routing admin page, click the Configuration icon ( ) next to the New skill type button. Use the drop-down menu to select the visibility configuration you want to apply to the skills field. I'm missing some explanation in the articles, what will happen if a ticket matches a Skill. The article doesn't say if the ticket is then assigned to an agent, a group of agents, or what business rules can be attached. Piggybacking on Wouter's comment ^ as it seems we're going in a similar direction. I also don't understand the specifics of where/how the routing occurs here and how it meshes with existing triggers/automations. I'd also like to see (either manually or via machine learning) some way of estimating capacity in the routing, via some method similar to agile story points. In the above scenario, if there are 2 French agents, it'd be incredibly helpful if the system could attempt to route a ticket to whichever one is a) available, b) has the most free capacity, and/or c) failover to some other location (i.e. a group) if neither agent can presently handle it. Can you provide more info on why skills aren't reevaluated on update like trigger conditions? The scenario I foresee is: customer fills out a contact form, selecting the wrong product/value --> Skill A is set. Agent w/ Skill A updates the ticket w/ correct product/value, which would then match Skill B instead (which they may not have). What's the utility of keeping Skill A set when the ticket has now been identified as needing Skill B? I understand this may be a limitation set for the early version of this feature to keep it simple but it seems like it'll be problematic in more complex routing scenarios, especially for internal transfers between teams (e.g. Support <--> Billing). Same as others above, I have tried playing with it in sandbox and although setup as described no routing occurs ? Thank you so much for the feedback! We're working on augmenting this documentation with some additional info. In the meantime, hopefully this will help. This is the first iteration of this feature, and it doesn't yet cover all the use cases we plan to support over the coming months. For now, we retain the "pull" paradigm of agents taking tickets from views. 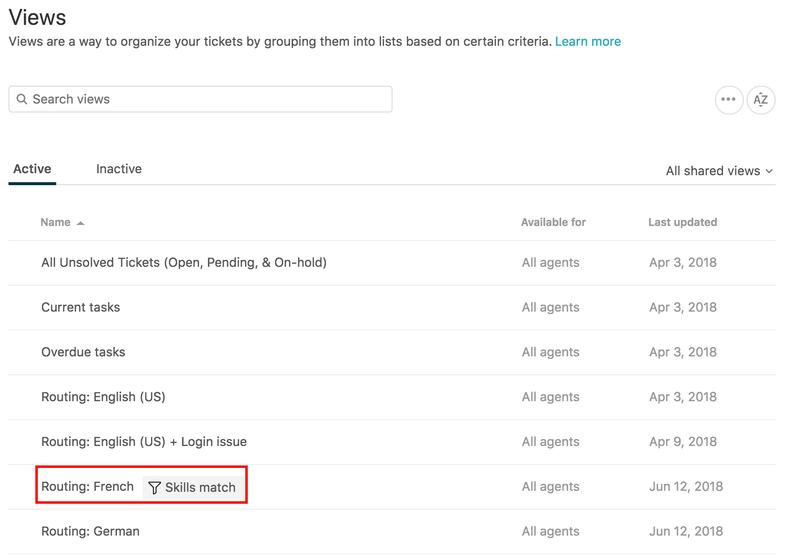 To show agents which tickets match their skills, add a "Skill match" column to the view. If the agent looking at the view has all the skills required by a ticket, that ticket will have a checkmark next to it. The next release will offer a filtered experience that will work with Play mode. Therefore, for many customers, this version of Skills-based routing is best suited to the time-consuming task of setting up and testing new routing flows. We've published some best practices to guide you. In addition to seeing how tickets are matched to an agent, you can see which skills were applied to a specific ticket, and update them if needed. Only admins can do this right now. This will help you QA and troubleshoot your new routing rules. Routing rules run before triggers, and for now on ticket creation only. Manually updating skills on the ticket is the only way to change them. We do not currently re-run routing rules on ticket update to ensure ticket update performance isn't compromised, but that use case (essentially, "re-routing") is one of the things we're working on for a future release. Additionally, we're working on a "push" paradigm of routing tickets directly to agents, which would likely entail a way to ensure that they're going to agents who are available and not overloaded. There's some more information about our plans for Routing in the launch announcement. This is just the first step in a long journey! I have a use case that may not have been considered. Can a ticket have multiple skills assigned to it? For example lets say that I have the "Mandarin" language skill, and the "Refund" skill. Both are different skill types but may be present on a ticket. Hi @justin -- a ticket can absolutely have multiple skills assigned to it! That's what makes skills-based routing especially powerful. An agent will be considered a match for a ticket if they have all the skills that ticket requires. So in the example you gave, an agent that only has "Mandarin" and not "Refund" would not be considered a match (in the future we will be looking at partial match logic). Hi, all. The article has been updated to (hopefully) clarify some key points, and better reflect the current functionality. Leave comments if you have any other questions or clarifications. Thanks! @kristen mirenda -- there needs to be an ability to show the skill match column as checked if the agent has ANY of the skills on the ticket (not ALL) of the skills. It's also really frustrating that if a given ticket doesn't have any skills applied that the ticket is shown as checked in the skill match column. Because of (b) I need to assign a skill to all tickets we receive that has no agents assigned, BUT because agents must have ALL skills assigned and I can't assign agents to the "mass skill" that I applied that means that the "Skill match" column never appears checked. Let's assume you have two skills. Skill one applies to every ticket received (so that they don't all appear as skill matched because they lack a skill), skill two applies to tickets with specific criteria. Skill one has no agents assigned and skill two has one agent assigned. Because of the fact that agents must have ALL of the skills and the agent assigned skill two but isn't assigned skill one, they never see skill match. Super frustrating! If every ticket without a skill wasn't checked as skill matched you'd solve a lot of headache and this product would work. Hi @andrew and @will -- I could not agree more! Both direct routing (assigning) to agents and partial skill match are part of the vision for the future. We're building this out one layer at a time. We know this version isn't optimal for all use cases, but we wanted to release it as soon as we had an end-to-end solution, rather than hold back completely until the feature is "done" (there's no such thing anyway). This approach allows us to provide something useful and lets us gather real usage data to inform our next iteration. I 100% get that there are a myriad of use cases but I don't understand how this product works properly. If a ticket doesn't have a skill it appears as skill matched. This means that in order to even think about "disqualifying" tickets from skill matching you need to assign the ticket a skill. So, seriously, this sounds snarky but it's not intended that way...how is this product supposed to work? What's a use case where this works as intended? Having a specific view for a skill? What's the point of skills then? I'm probably totally missing the mark but trying to figure out an example of where skill matching works. If we're more and more going to use Views for agents to see what they need to be working on, rather than the home 'Tickets requiring your attention', it would be useful if we could replace 'Tickets requiring your attention' with a (custom) View, that is shown to the Agent in place of the default 'Tickets requiring your attention'. Is the new Routing feature an easier interface to design triggers or is it a replacement for triggers? 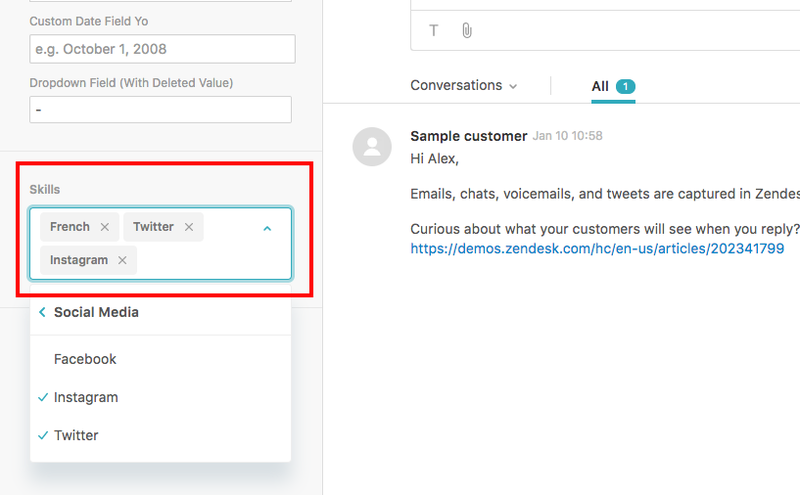 In my zendesk account an agent can be in multiple content specific groups. I have triggers setup to route tickets to the correct content group by string searches so agents can solve tickets based curent priority of their content. It would be nice if routing gave a choice to assign to an agent or a group under skills. It's all good @will -- this is part of the learning. We conceived of a "skill match" as answering the question, "does the agent have all the skills needed to take this ticket?" -- that's why a ticket with no skills will match everyone. If you want to disqualify tickets from skills matching, could you work with the conditions on the view where you put the column? Would you also mind talking a little about the use case for disqualifying tickets to help us understand what you’re trying to do? @tom -- That's similar to the direction we're heading. We found that not a lot of customers made use of 'Tickets requiring your attention' however -- how are you using it? @paul -- We envision this as a replacement for some (actually, a lot of) triggers. We also envision it as a replacement for some groups that exist solely to segregate the tickets a particular agent can work on. We are working towards direct agent assignment as part of automated routing, but you will always be able to use triggers in concert with routing rules if you so choose. There's been such great feedback in the comments sections of a few different articles relating to the current release of Skills-Based Routing. We'd love to have most of that happening in one place, and we think the release announcement makes the most sense. So if you'd like to provide input, please do it there! It'll be easier for us to respond, and you'll be able to see and engage with others' ideas as well. Just a note that @Massimo's question has been answered in the comments of the release announcement, where we're currently funneling the discussion. When configuring skill conditions, we are missing ticket fields in the drop down options. Why is this? Are some excluded for a reason? Hi @amber, it depends on which ticket field you're looking for. Not all of them were included -- generally we included ones that were available or relevant on ticket creation. Custom fields should be supported as well. If you're looking for a newish custom field you might try a hard refresh on the admin UI. It seems as though, at the moment, we can only set 1 view for skills match on the routing settings page? Are there any plans to allow this to be set on more than one view? Hi @Sean! That's in the plan, but first we want to make sure it's solid with the one view limit under real-world usage. I can't give you timing yet, we're gathering performance data and the more folks use it the sooner we'll know! Can agent skills be updated/changed via api? Hi @Alex! Not yet, but that's high priority in our backlog. Hi Kristen, this goes together with the options to admins to update the skills of a ticket via the API I assume? Surprised the feature is first released before the API, normally this is the other way around. Hi @Martjun -- ideally, but we don't have a delivery plan yet as it's still just in the backlog. Hello! Are there any plans for us to be able to grant non-admin roles the ability to change what agents are assigned to which skills? We'd love to be able to have our agent supervisors change those at their discretion. HI @Brandon -- it's on the backlog, but I can't give you a timeframe yet. But thank you for describing the use case, that's really helpful! @Kristen - I promise I have read through this before asking and it sort of looks like you were just asked this but I think the question was about changing the Agent skills. My question is, it looks like the document was updated that the agent could now change the skills on the ticket, where initially only an Admin could. Am I seeing that correctly? Our agents have to clean up so much for our clients it really makes it a deal-breaker for us if we can't clean up the skills. Hi @Wes! Good spot -- I think perhaps you saw a premature update that was briefly/mistakenly live. So I might as well tell you what's coming! As mentioned in the announcement a few weeks ago, we're working on a setting to configure whether the skills box does or doesn't show up on the ticket form for admins. The use case here is when the admin has tried out SBR but decided not to roll it out. This will provide a way to make that box go away if you're not using it. In the course of implementing that, we realized that we could probably use this setting to cover view/update options for both admins and agents. So we went for it, even though it's solving a different problem. We will test it out in beta first. However, we've decided to hold back just for now on the update option for agents. Because we're also working on the ability to re-run routing rules on a ticket, and we want to think about automatic and manual updates together. Admins see an editable skills box, agents see a view-only version. Admins see an editable skills box, agents see nothing. We didn't want to pile too many use cases on this one enhancement. But soon we'll take the next step and test a solution to the additional need that you described. At this stage in our evolution, Zendesk workflow has reached a level of complexity where we want to be careful introducing changes, especially to agents. Doing it incrementally gives us room to test use cases separately and more easily unwind if we need to. TL;DR: we well are on our way to allowing agents to update skills on tickets, via incremental steps to allow us to get it right.